There are two main problems with popular approaches to history in general: history is frequently reduced to mere fact-listing, and “history” often amounts to uncritical hero worship. The same is true of popular Black history narratives. Too many times are we forced to sit through lectures like this one: “Winston A. Freeman, a BLACK MAN, invented the screw that holds together toenail clippers!” And forget the Barbershop controversy, my colleague Chauncey is quite familiar with black folks who think it’s disrespectful to tell the truth: that Parks’ protest was planned. Unless we cultivate nuance and complexity in our traditional historical narratives, Black history will be little more than trivia to build black kids’ self-esteem and “educate” others about our contributions. By nuance and complexity, I don’t mean just acknowledging that our heroes are subject to the same human failings as the rest of us (though we need that too); I mean re-examining the core of why we celebrate the subjects of traditional Black history. 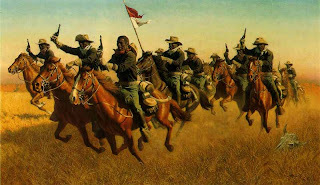 Consider the Buffalo Soldiers. While they are celebrated as paragons of courage and patriotism in the face of American racism, it’s incredible how rarely their defenders question their missions: displacing Native Americans during the so-called Indian Wars, beating back Mexican insurrections, aiding imperialist efforts in Cuba and the Philippines. By the way, I just don’t buy the argument that they deserve to be honored strictly based on their military service independent of whom they fought. Praising military service independent of the cause is questionable to say the least. I don’t think we want to go there. Consider Madame CJ Walker. Her story is inspiring—self-made, independent black woman makes fortune through her business savvy in creating and marketing her line of black beauty products. That’s good stuff. 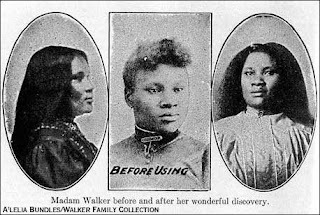 Now think about the vigor with which her defenders deny that Walker invented the hot comb (they’re right, actually) and sold skin-bleaching creams (they’re wrong on this one). This is clearly the desire to praise a black female entrepreneur clashing with later “Black is Beautiful” norms. But what’s wrong with placing Walker’s beauty products in context, noting that they were based on facilitating European notions of attractiveness? Doing so doesn’t diminish her accomplishments; it merely situates her among the racial norms of the time. In short, we promote a more mature and more relevant Black history if we draw out tensions instead of ignoring them or attacking those who highlight them. Very nice. I appreciate this. This new standard is the gateway towards refinement and high culture. The beauty in your approach is that it finds greatness in things that are already present within the black experience while still using a set of values in selecting what to celebrate. I'd like to pitch Patrick Adams and Leroy Burgess as being worthy for recognition for Black History Month. I truly believe that the mid to late 70s is the high watermark for Black culture. These men nearly single handedly bridged the gap between Disco, NY Garage style, Chicago House, and Deep/Souful House Music. Late 80s Chicago House that was profoundly inspired by Leroy Burgess. Today, deep and soulful house music is, in many ways, the collective national anthem black folks of discerning musical tastes. Leroy Burgess and Patrick Adams started in disco and proceeded with quality productions that influenced black dance music in the most profound ways. While there were influential moments and persons in those moments throughout the trek towards deep and soulful house music (ie. Franke Knuckles, Larry Levan, the opening of The Loft, and Tony Humphries), Patrick Adams and Leroy Burgess effected a strong and lasting impact that continued throught the entire evolutionary time line of black dance music. Were it not for these men, there would, quite possibly, be no NY Garage style tracks for Frankie Knuckles to play at the Warehouse which would ultimately influce the efforts of the Chicago House pioneers who labored over their Roland 909s and drum machines. And of course, these yoeman amateur musicians would be the foundation upon which Techno, and Deep/Soulful House music is founded. Also, I'd like to offer a motion that Tom Moulton be made an honorary black person for the month of February since he is the inventor of the 12 inch single, the staple of the dance music industry. the c j walker story is a great example.. mme walker operated i her time.. the rules and views were different.. you cannot overlay the mores of our time on hers..
if i had the necessary funds back then i probably would have straightened the hell out of my hair.. we all would have..
Makes sense. Thanks for posting this entry. Madam C.J. 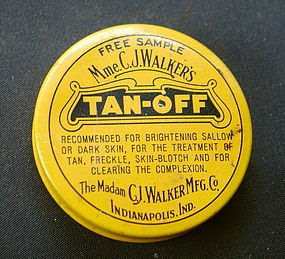 Walker refused to sell skin bleaching products. Her most famous product was the Wonderful Hair Grower, which she created after she realized her hair was falling out. After she died in 1919 the company was taken over and started to produce skin bleaching products in an effort to stock products in retail outlets.